Griggs and I had a day of flying to get from Invercargill, NZ to Launceston, Tasmania. TASMANIA!!! It’s surreal to say I’m in TASMANIA! It still doesn’t even feel real. To get a visual of what our full day of flying entailed, here’s a photo of our flight from Invercargill, to Christchurch, to Melbourne, to Launceston. 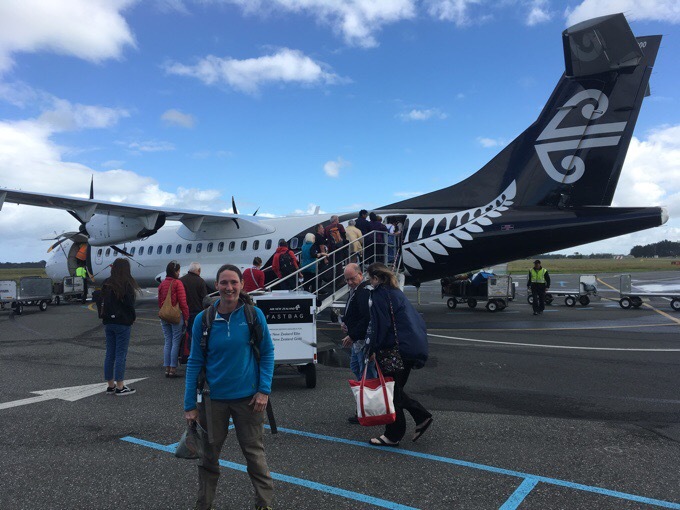 Not everyone who flies from New Zealand to Tasmania takes such a circuitous route, but it was what gave us the best times and prices. I’m sure there is a way to fly directly for those that can afford to do that and wish to spend less time flying. 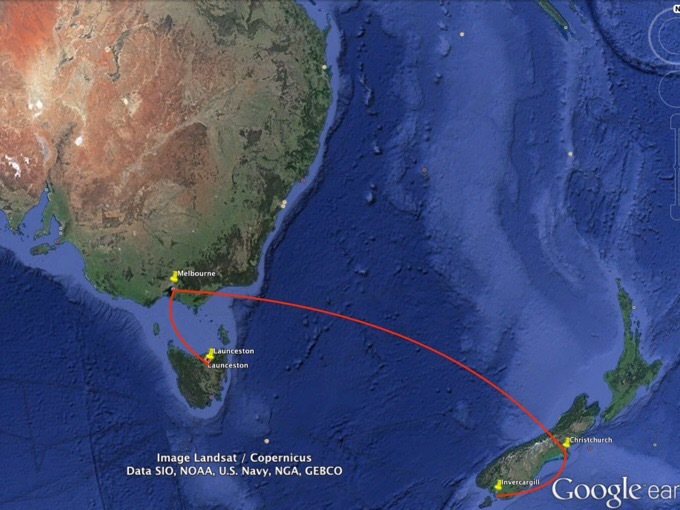 Our flight path from Invercargill, to Christchurch, to Melbourne, to Launceston. One of the ceremonial plane shots for my nephews who are absolutely obsessed with planes and any mechanical mode of transportation. 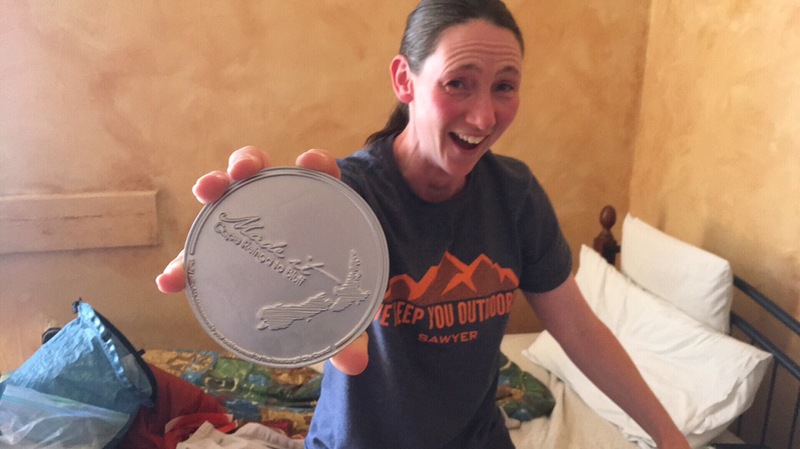 Before we flew out, we went by the Invercargill iSite and picked up the finisher medal they provide for free to TA Walkers. It was fun to get and nice that they do that. All of our flights went super smoothly and we nailed all the timing so well. We can’t believe how well things have flowed for us in the last month or so with timing in many ways. One thing to note is that our first flight out of Invercargill had absolutely no security check at all. We were in shock. I guess I didn’t need to get rid of my extra cooking fuel after all… We have no idea how this is even possible these days. Just crazy. 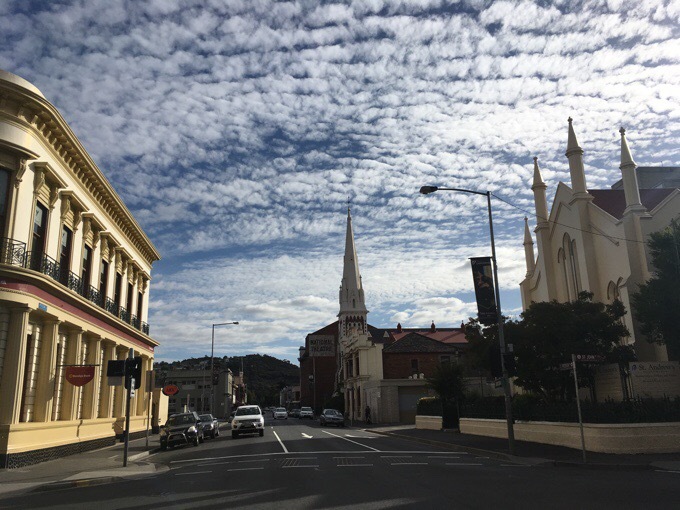 We arrived in the evening to Launceston, Tasmania and checked into the Arthouse Hostel. It’s a great deal and has speedy wifi. We are happy hostelers! We had a zero day today to get settled, and were stoked to be in Tasmania. We were bummed the airport didn’t have some big WELCOME TO TASMANIA sign and we struggled to find things in town too. The best we could come up with was a license plate, haha! We took the day to organize things, resupply, work out details for our time in Tasmania, and walk around town. 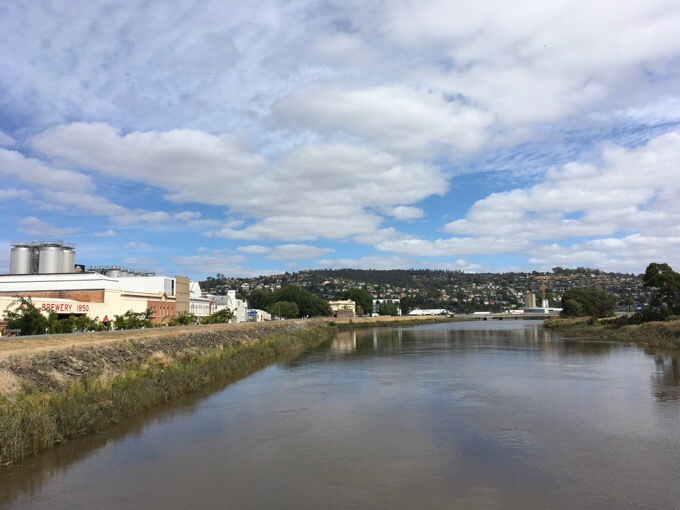 Launceston feels like an industrial kinda factory town. It is a bit nicer with spots with cute squares and a busier downtown core. No major scenery yet other than old brick buildings. Funny that we both agreed that it reminded us of Scranton Pennsylvania, which is where The Office is set and a place we both happen to have been. It is the second largest city in Tasmania and a 3hr bus will get us to the start of the 48mi/78km Overland Track tomorrow at Cradle Mountain-Lake St Clair National Park. Tasmania doesn’t have one long trail, so we will be spending a month doing many shorter hikes/tracks/circuits. First up is the famed Overland Track that brings many to Tasmania. It isn’t cheap as permits are $200AUS/$150US per person and then there is a $30AUS/$22US parks fee we each will also need to pay. We booked it about three weeks ago. There are 34 people allowed to start a day, and there are huts along the way, but camping is allowed pretty much anywhere. There’s no time restriction or mandated itinerary, which is nice, so we are bringing a week of food and hitting popular side hikes (including Walls of Jerusalem) along the way. I’ll talk more about it as we hike, but we are really looking forward to it. As for the rest of our time in Tasmania, we have a list of the top hikes we’d like to hit over the next month. I’ve pinpointed them on a map of Tasmania to give everyone an idea of where we’d like to go. To give an idea of how large the island is, it is 186mi/300km wide horizontally and 138mi/222km vertically. 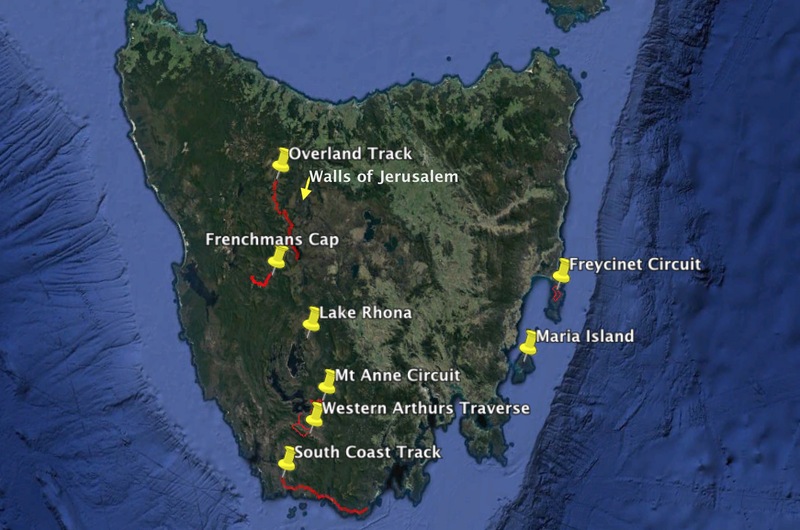 The two main tracks we will do that will each take about a week are the Overland Track and the South Coast Track. The rest will be prioritized by weather and time. Many of those are quite short just 1-3 nights. Apparently the west side of Tasmania is the wet side, and the east is the dry. We’ve been advised to hit the west side when weather windows open up and do the more eastly stuff while we wait for those windows. Chances are we may not hit everything on the list, but we are ok with that and will do what we can. Car rental is super affordable out here, so we may do that at some point. I think we are approaching shoulder season, and Tasmania is quite a wet place even in the “dry” season. It can snow at anytime in the year it seems, so we each added a thin fleece to our layers just in case. So far, it’s actually going to be mostly warm and sunny for the next week, so we are quite fortunate to have great weather lined up for the Overland Track. Yippee! 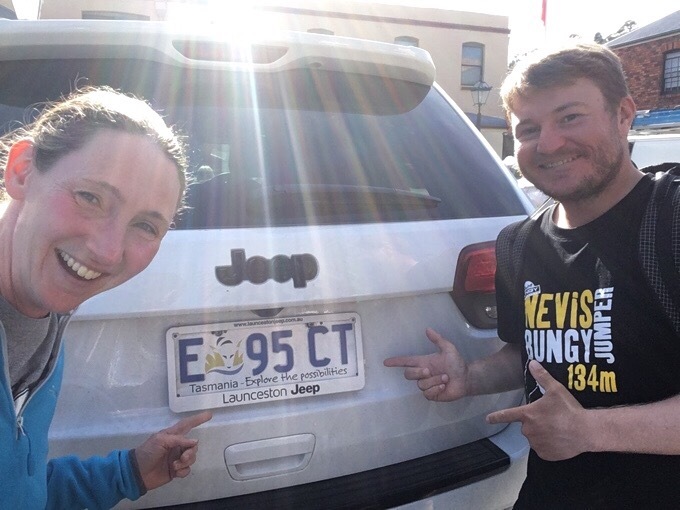 Let the Tasmania exploration begin! Don’t forget to add Griggs on Instagram @griggsdomler if you’d like to follow as he is trying to do daily updates as well! *Note: I’m not sure how good service will be, so it could be a week before I’m able to post again. Hopefully not, but possibly. Another adventure … I can´t wait! And Griggs t-shirt …134 m bunjee jumper! Just imagining this void makes me really uneasy. Welcome to Tassie! You should be able to get mobile service (at least with Telstra) from most of the mountain tops you’ll reach as side trips off the Overland. Hope you have a wonderful time! Tassie is an amazing part of the world. Especially the further inland you head. I love cradle mountain. I’m sure it’s going to be a great one! Hopefully we will overlap.